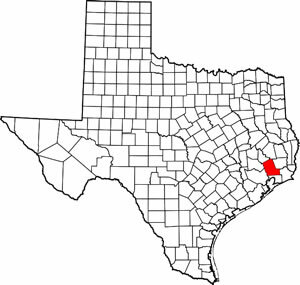 According to the U.S. Census Bureau, the county has a total area of 3,046 km² (1,176 mi²). 3,004 km² (1,160 mi²) of it is land and 42 km² (16 mi²) of it (1.41%) is water. Description: Shows rivers, lakes, creeks, streams, cities, towns, outlying buildings--including schools and churches, roads, highways (giving mileage between points), bridges, railroads, cemeteries, oil or gas wells, canals, and state roadside parks. Insets: Daisetta, Hull.